Vector’s elegant smartwatch takes you from "what time is it?" to "what’s the latest news?" without sacrificing an ounce of style—or looking at your phone. And its long battery life means less worrying about keeping it charged. Use Luna as a fitness tracker to monitor steps or calories, or set it to receive notifications for texts, emails, or other apps. For those who want a few smart features on their wrist, without the full-phone functionality of an Apple watch, it’s a nice balance of sophistication and tech. You can’t answer messages or post on social media, for instance, Luna instead is a way to stay discreetly connected. The designs are made with stainless steel, mineral glass, and fine grain leather. The face is customizable, too—pick one out in the app, where you also set up the notifications you want to receive. Founder Andrei Pitis created this watch when he realized wearing a smartwatch and an activity tracker at the same time was cumbersome—as was charging them both every night. Thanks to a low-power processor, Luna’s battery life lasts up to 30 days and it charges fast—in about an hour. Hello Grommet fans! I’m Bogdan Ripa, Product Director at Vector Watch. I am excited and honored to introduce you the smart watch with a 30-day battery life, featured as today’s Grommet. I'd be happy to answer any questions you have! What are the main benefits of Luna Smartwatch compared to Apple Watch? The first things that people notice are the classical watch design, 30 day battery life and its compatibility with iOS, Android and Windows phones, which makes it a perfect gift. As you dive deeper, things like its elegance, simplicity, and the pursuit of "what truly matters" will stand out. It does what you would expect from a smart watch supporting multiple watch faces, applications, and as a bonus, you can easily read it in bright day light thanks to its always-on reflective display. When will the Win10 update be available?Will there be further support for win10 in the future?will the app be updatet continously? We do our best to release updates on a monthly basis, with the next publicly available Windows 10 update scheduled for next week. We also run beta programs, with the 1.1 Windows Phone beta going out tomorrow assuming quality assurance approval. I'm Irina, also part of Vector Watch team and a female user for more than an year now. Vector was designed as a unisex watch and the 44mm diameter fits well an average size women wrist. Personally, I like matching the straps with my daily outfits so I replaced the standard band with several leather bands in light colors and a bright red silicone band for the weekend. You can use any 22 mm wide band to create your own style and we encourage all users to take advantage of the versatility of this smart watch and replace the bands with what suits them best. A photo of a woman's wrist wearing the watch would help women decide which style to buy. Well, that is almost 1.75 inches...a little large for me. The wrist is my only petite area. But will keep it in mind. Thanks so much! Susan, the face of the watch will remain the same, it comes down to which band you want to start with. As Irina said above, you can use your own band for your own style. Julie, if smaller versions become available, we'll be sure to let you know. Beside notifications, what apps and functions do you have and do you have updates? There are two type of apps that we support. Streams - that are glanceable pieces of information that you can add to any watch face, and "traditional" smart watch apps. Facebook, Twitter, Instagram, Timezones, Weather, Stock Price, as well as a steps, distance and calories streams, displaying your daily progress towards your activity goals. In terms of apps, we have at this point in the app store (free of charge) an Agenda and Calendar app, a Camera Shutter app that lets you use your watch as a remote for your phone's camera, Nest, Evernote, Wunderlist, A music app that lets you control the music on your phone and more to come. Please note that some of these apps are not (yet) compatible with Windows Phones. You were also asking about updates. We usually release monthly firmware and mobile app updates, with watch app updates coming any time. What body functions does it currently monitor, and does it need to have a smart phone to record and track that collected data? Or is it able to be a stand alone unit. The watch has the 24/7 activity tracking functions you would expect. It will monitor steps (walking and running), distance, burned calories (active plus passive) but also your sleep duration and quality assuming that you are the type that sleeps with the watch on. To measure distance and calories you will have to enter your profile information in our mobile app - like age, gender, weight and height. And yes, it is able to measure all that without being connected to your phone, so you can use it as a standalone unit - just like a regular watch. 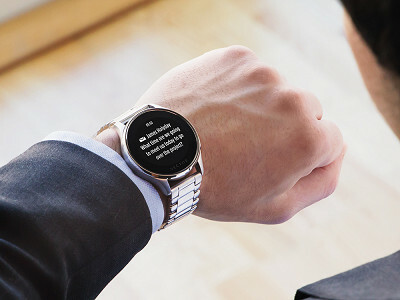 But you won't benefit from the notifications features or other ones that require the watch to be connected. To get updates, such as text messages, does the watch require that the user's phone be nearby? Yes, the phone needs to be nearby. 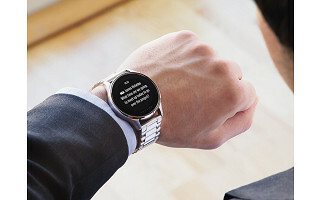 The watch connects to the watch via Bluetooth Low Energy and that's how notifications (such as text messages) get to the watch. However, the watch and the activity tracking functionality will continue to work just fine. hi, this looks like a great product, but why no option to have the black face with BLACK leather strap? That would be a bit more chic for a design that looks a bit thick? I'd love all black but not interested in black metal band. Also, how would this fit / look on a woman's wrist? Unfortunately we don't have the black face / black leather strap SKU, but thanks for the suggestion! As far as how it fits on a woman's wrist, please see Irina's reply above. @Tracy I'm with you on the black on black. No metal band, black leather would be much preferred. I find metal bands pinch. Thanks for the suggestion, Bradford. It could be something developed down the line. Is there a way to get a slightly longer band (bracelet style?) I come in a little to big for the 218 mm maximum. What model are you looking at? They tend to be pretty big. However, you should know that the bands have a standard 22mm width, so you can buy new ones from any jewelry store or online, and they should match just fine. Does your watch have a heart rate sensor? No, the watch does not have a heart rate sensor. Are you planning to make a women's version? The only smart watches that I have found for women are very high end Movado watches. I would love to own a steel bracelet smart watch!! I do have a Samsung now and it is just not a "pretty" watch. Please see Irina'answer at the top of the comments thread. Vector’s elegant smartwatch takes you from "what time is it?" to "what’s the latest news?" without sacrificing an ounce of style—or looking at your phone. And its long battery life means less worrying about keeping it charged. Use Luna as a fitness tracker to monitor steps or calories, or set it to receive notifications for texts, emails, or other apps. For those who want a few smart features on their wrist, without the full-phone functionality of an Apple watch, it’s a nice balance of sophistication and tech. You can’t answer messages or post on social media, for instance, Luna instead is a way to stay discreetly connected. The designs are made with stainless steel, mineral glass, and fine grain leather. The face is customizable, too—pick one out in the app, where you also set up the notifications you want to receive.